Part One is for patients and Part Two is for the clinicians who care for them. Both sections have relevant information and a complete reading of the entire article is recommended. Due to the fluid nature of this subject, this post will be updated regularly as new information becomes available (Last update: August 10, 2018). The abrupt closure of a pain clinic is stressful for patients. Concerns include worsening pain, medication withdrawal, and finding a new pain care provider. 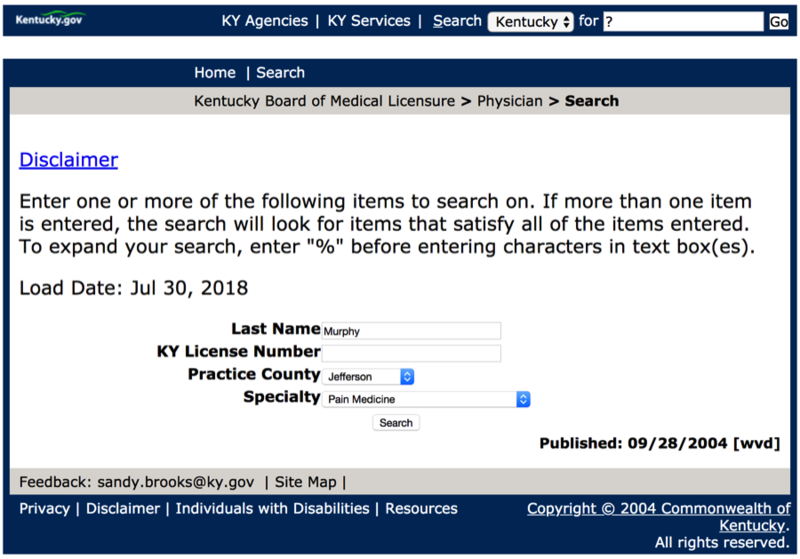 This article catalogues resources and information that may be useful to patients, particularly in the Greater Louisville (KY) area, suddenly faced with lost access to their pain care provider. This following information is for chronic pain patients and does not address the needs of a person struggling with addiction or a substance use disorder. If you think you may need substance use treatment services, call the KY Help Call Center toll-free hotline — 1-833-8KY-HELP (1-833-859-4357). If you’re struggling to deal with your pain and are feeling hopeless or distraught, please call the National Suicide Prevention Lifeline at 1-800-273-8255. The Metro United Way Crisis Hotline is accessed by dialing 211. Why was my pain clinic closed? Do I want to go back there? Do I need to find a new pain clinic? Will my current prescriptions be accepted by my pharmacy? What can I expect if I have to taper or discontinue medications? Risks? Should I seek to alter my current pain care regimen? Change course? Will my primary care physician treat me during this process? When we think of pain medications, we usually think about opioids. But medications other than opioids are often used in pain management and can also lead to withdrawal symptoms, if tapered rapidly or discontinued (e.g. benzodiazepines, gabapentin, anti-depressants). If circumstances force you to taper, do it as gradually as possible and seek guidance from your physician. You might also ask your pharmacist for help with calculating a gradual taper using the medications you already have. Opiates – Many people are surprised to learn that in most cases, withdrawal from many opiates is not deadly. Benzodiazepines – Benzos were introduced as a replacement to barbiturates that were causing common overdose cases, many of which resulted in death. Nevertheless, withdrawal from extended use of benzodiazepines can kill. Whether Xanax (alprazolam), Ativan (lorazepam), Valium (diazepam) or other variations, long term use of Benzodiazepines requires medical supervision to be completed successfully with minimal side-effects and risk to the patient. Pregnant women, children, the elderly, and patients with heart disease, seizure disorders, and depression are at particular risk if forced into withdrawal. Specifically, opioid withdrawal during pregnancy has been associated with spontaneous abortion and premature labor. If you are worried about withdrawal or if it becomes unmanageable, get proper medical advice (i.e. see your physician or go to the ER). Patients with chronic pain who take opioids and other controlled substances will in most cases develop physical dependence on medications. This is a normal physiologic response and is not addiction. However, withdrawal from medications can certainly make a person feel as though they are addicted. It is important to make the distinction. The group Physicians for Responsible Opioid Prescribing have posted an informative video regarding physical dependence. If you cannot get medications (refills or replacement meds), you may find yourself with no viable option other than to taper your medications. If tapering happens too quickly, the possibility of uncomfortable (and perhaps life-threatening) drug withdrawal exists. Although the clinical evidence review did not find high-quality studies comparing the effectiveness of different tapering protocols for use when opioid dosage is reduced or opioids are discontinued, tapers reducing weekly dosage by 10%–50% of the original dosage have been recommended by other clinical guidelines, and a rapid taper over 2–3 weeks has been recommended in the case of a severe adverse event such as overdose. Experts noted that tapers slower than 10% per week (e.g. 10% per month) also might be appropriate and better tolerated than more rapid tapers, particularly when patients have been taking opioids for longer durations (e.g. for years). If you’ve taken opioids for less than two weeks, you should be able to simply stop these medications as soon as your prescribed course of pills runs out, if not before. Don’t try to go cold turkey on your own. When it’s time for you to stop taking opioids, ask for your doctor’s help to develop a medication withdrawal plan (called a taper) that gradually reduces the amount of medication you take. Opioid withdrawal can be dangerous, and symptoms can be severe. Depending on the type and dose of drug you’ve been taking, it may take weeks or even months to gradually and safely reduce your dose and get off your opioid medication. Stopping opioids can be difficult, but you can do it. You’re much more likely to succeed if you partner with your doctor, plan your taper schedule, manage your symptoms and learn alternative ways to cope with pain. A step-by-step reduction in your dose helps this process go smoothly and helps ease the discomfort you may feel when you stop taking opioids. It also allows you to practice new skills to manage pain and other chronic symptoms. Your pharmacist should be able to steer you toward non-prescription medications to help with the symptoms listed above, such as: pain and fever (e.g. ibuprofen and acetaminophen); nausea and vomiting (e.g. Kaopectate, Pepto-Bismol, diphenhydramine, Dramamine); diarrhea (e.g. loperamide). Always take the dose of over-the-counter medications as directed by your health care professionals or according to the label. Taking more than prescribed or listed on the label can be dangerous. IMPORTANT: Do not take anyone else’s medications. Do not acquire prescription drugs (or illicit drugs) off the street (Aside from committing a crime, you might get a counterfeit drug that will kill you. Do not resort to the numerous “home remedies” you’ll find on the Internet. Do not use Kratom or marijuana or alcohol as side-effects or drug interactions might be lethal, especially in a person going through withdrawal from pain medications. Some evidence is emerging that would indicate cannabinoids have a role in attenuating opioid withdrawal symptoms. Marijuana is still illegal in most states (including Kentucky and Indiana) and is not recommended, however industrial hemp products (e.g. hemp oil extracts high in CBD) are becoming readily (legally) available and could be useful. Ask your physician for guidance. It may be easier to get care from a different health care provider if you have your medical records. Do not panic. There are many sources of your health records. Contact your pain clinic and request a copy (If they say it will take a long time, ask if you can at least have the most recent office notes). Your insurance company may have records. Hospitals where you have had care recently will have records you may request. Labs and drug screening facilities will have records. Facilities where you had tests (e.g. MRI, CT scans, ultrasounds) have records. Other specialists or clinicians (e.g. surgeons, physical therapy) have records. Your pharmacy will have records on your medication history. Your best bet initially might be asking your primary care provider for help. If you don’t have a primary health care provider, contact your health insurance company. Here you can search for every Pain Management or Pain Medicine physician (and an array of other specialties) licensed to practice in the state of Kentucky. You can even narrow the search down by county. The listing will provide an address and phone number (as well as any disciplinary actions assigned to the physician). A group of local pain specialists, the Kentuckiana Coalition of Pain Experts (Kentuckiana COPE), have come together to help in the event a pain clinic suddenly closes and patients find themselves suddenly without access to care or advice. Please understand that this humanitarian effort is voluntary on the part of the providers, at the discretion of the provider, and there is no guarantee that care or advice will be offered. However, the group believes that we should come together as a community to help our neighbors when they, by no fault of their own, suddenly find themselves medically orphaned due to the sudden closure of their pain clinic. Note: This toll free number is not manned. It is not a crisis hotline. It is not a general referral service for patients. And there is no guarantee you will get a call back. If you think you may have a medical emergency, call your doctor, go to the emergency department, or call 911 immediately. This blog post will be updated with, lists, phone numbers, and additional resources when new information becomes available. Please check back on a regular basis. And don’t give up hope. This situation may be difficult, but it may also be a chance for a new beginning. Note: All clinicians should be familiar with the information in Part One (above) as this is what your patients are reading. Do you continue the current regimen? Do you change the regimen (e.g. taper or devise a new plan)? Do you decide not to prescribe any medications and deal with the withdrawal? The answers to these questions can only come from the individual care provider. Of course, we want to alleviate suffering. But we also must practice medicine in a manner for which we feel adequately prepared. Some prescribers may feel comfortable with higher doses and specialty formulations of medications. Others may be willing to prescribe (within a narrower set of personal boundaries) commonly prescribed medications with which they have familiarity. And there will be some clinicians who honestly feel they are not equipped (i.e. training, experience, manpower) to prescribe controlled substances at all. These are personal choices to be made after an honest critical self-evaluation. Clinicians should empathically review benefits and risks of continued high-dosage opioid therapy and offer to work with the patient to taper opioids to lower dosages. Experts note that patients tapering opioids after taking them for years might require very slow opioid tapers as well as pauses in the taper to allow gradual accommodation to lower opioid dosages. Unless addiction or drug diversion is apparent, or if there is an elevated risk of overdose, rapidly stopping opioids is not recommended. The U.S. Centers for Disease Control and Prevention specifically advises against rapid taper for people taking more than 90 mg MED per day. Clinicians should assess patients on more than 90 mg MED or who are on combination therapy for overdose risk. Prescribe or provide naloxone. More on this topic is in the New England Journal of Medicine. Perhaps the best treatment for withdrawal is to give the patient the medication from which they are withdrawing. Often a lower dose than they are accustomed to taking will be sufficient. One method I have found to be effective for treating opioid withdrawal is to calculate the patient’s MEDD (morphine equivalent daily dose) and then provide the patient with a percentage of this MEDD (e.g. 80-90%), in the form of immediate release medication, for a few days and then re-evaluate. Since there is cross-tolerance among the various opioids, a clinician does not necessarily have to refill the patient’s current prescription. Instead the clinician may prescribe opioids with which he or she feels more comfortable (i.e. Percocet instead of Oxycontin) and still treat the patient’s withdrawal effectively. Note: This does not apply to tapering with methadone. Methadone taper protocols should only be prescribed by a physician experienced with treatment with methadone. Tapering with Suboxone (i.e. buprenorphine/naloxone) requires a special DEA registration and is beyond the scope of this article. Fortunately, there are a number of well-vetted protocols to guide us. An effective plan of care is born of knowledge about the patient (e.g. H&P, studies, medical records), knowledge about the medications, and knowledge about medication withdrawal. For primary care providers who do not want to write the medications, they may have to deal with treating withdrawal. I found an excellent and easy to use guide to treating opioid withdrawal in chapter 4 (and other medications in other chapters) from the World Health Organization. As noted above in Part One, the CDC has published a concise “pocket guide” to tapering. This is perhaps the best reference for the busy Primary Care provider to quickly get up to speed on a proper course of action. Realistically, even the most conscientious tapering plans can miss the mark, and withdrawal symptoms of varying severity can occur. Also, as stated above, some clinicians will make the decision not to prescribe any controlled substances in treatment of their patients’ withdrawal. In either instance, clinicians need to be aware of what is available (over-the-counter as well as by prescription) to treat withdrawal symptoms. The World Health Organization has guidance on medication management of withdrawal as well. Compared with methadone-aided withdrawal, clonidine has more side effects, especially hypotension, but is less likely to lead to post-withdrawal rebound. Dropouts are more likely to occur early with clonidine and later with methadone. In a study of heroin detoxification, buprenorphine did better on retention, heroin use, and withdrawal severity than the clonidine group.12 Since clonidine has mild analgesic effects, added analgesia may not be needed during the withdrawal period for medical opioid addicts. Supportive measures: Insomnia is both common and debilitating. Clonazepam, trazodone, and Zolpidem have all been used for withdrawal-related insomnia, but the decision to use a benzodiazepine needs to be made carefully, especially for outpatient detoxification. Treatments for ancillary withdrawal symptoms include nonsteroidal anti-inflammatory drugs (eg, ibuprofen or ketorolac tromethamine) for muscle cramps or pain; bismuth subsalicylate for diarrhea; prochlorperazine or ondansetron for nausea and vomiting; and a2-adrenergic agents (eg, clonidine) for flu-like symptoms. Vitamin and mineral supplements are often given. In addition to the other standards established in this administrative regulation, for purposes of treating pain as or related to an acute medical condition, a physician shall not prescribe or dispense more than a three (3) day supply of a Schedule II controlled substance, unless the physician determines that more than a three (3) day supply is medically necessary and the physician documents the acute medical condition and lack of alternative medical treatment options to justify the amount of the controlled substance prescribed or dispensed. Document a plan (P) that explains why and how the controlled substance will be used. Teach (T) the patient about proper storage of the medications and when to stop taking them. Perform an appropriate history and physical exam (H). Obtain informed consent (I). Note: consent must be in writing, if prescribing a Schedule II drug. No use of long acting (e.g. extended release) meds initially (N). And run an initial KASPER query (K) of the state’s prescription database – and at least every three months thereafter. Indiana’s electronic prescription database is called INSPECT. For the sake of brevity, I recommend Indiana prescribers do the same as Kentucky prescribers, although the initial prescription in Indiana may be for up to 7 days. The relationship between a patient and a physician is based on trust, which gives rise to physicians’ ethical responsibility to place patients’ welfare above the physician’s own self-interest or obligations to others, to use sound medical judgment on patients’ behalf, and to advocate for their patients’ welfare. Disclaimer: This is for informational purposes only, does not constitute medical advice or a patient/provider relationship, and is not a substitute for seeing your medical provider. I have made every effort to cite references where applicable, however the opinions expressed are my own and have not been endorsed by any organization. Links to references or other materials are taken at your own risk. The content provided here is not intended to be a substitute for professional medical advice, diagnosis, or treatment. Always seek the advice of your physician or other qualified health provider with any questions you may have regarding a medical condition. Never disregard professional medical advice or delay in seeking it because of something you have read on this website. If you think you may have a medical emergency, call your doctor, go to the emergency department, or call 911 immediately. Addressing a subject of this nature can only approach adequacy with the help of my colleagues, confidants & patients. To all who have contributed, I am profoundly grateful. That being said, the opinions expressed in this article are my own. When in the course of human events it becomes necessary for patients to dissolve the chemical bonds which have connected them with opioids, one can look to the Centers for Disease Control for guidance. Established patients already taking high dosages of opioids, as well as patients transferring from other clinicians, might consider the possibility of opioid dosage reduction to be anxiety-provoking, and tapering opioids can be especially challenging after years on high dosages because of physical and psychological dependence. Experts noted that patients tapering opioids after taking them for years might require very slow opioid tapers as well as pauses in the taper to allow gradual accommodation to lower opioid dosages. Clinicians should remain alert to signs of anxiety, depression, and opioid use disorder that might be unmasked by an opioid taper and arrange for management of these co-morbidities. For patients agreeing to taper to lower opioid dosages as well as for those remaining on high opioid dosages, clinicians should establish goals with the patient for continued opioid therapy, maximize pain treatment with nonpharmacologic and nonopioid pharmacologic treatments as appropriate, and consider consulting a pain specialist as needed to assist with pain management. Experts noted that tapers slower than 10% per week (e.g., 10% per month) also might be appropriate and better tolerated than more rapid tapers, particularly when patients have been taking opioids for longer durations (e.g., for years). When opioids are reduced or discontinued, a taper slow enough to minimize symptoms and signs of opioid withdrawal (e.g., drug craving, anxiety, insomnia, abdominal pain, vomiting, diarrhea, diaphoresis, mydriasis, tremor, tachycardia, or piloerection) should be used. A decrease of 10% of the original dose per week is a reasonable starting point; experts agreed that tapering plans may be individualized based on patient goals and concerns. Experts noted that at times, tapers might have to be paused and restarted again when the patient is ready and might have to be slowed once patients reach low dosages. Tapers may be considered successful as long as the patient is making progress. Once the smallest available dose is reached, the interval between doses can be extended. Opioids may be stopped when taken less frequently than once a day. More rapid tapers might be needed for patient safety under certain circumstances (e.g., for patients who have experienced overdose on their current dosage). Ultrarapid detoxification under anesthesia is associated with substantial risks, including death, and should not be used. Clinicians should access appropriate expertise if considering tapering opioids during pregnancy because of possible risk to the pregnant patient and to the fetus if the patient goes into withdrawal. Patients who are not taking opioids (including patients who are diverting all opioids they obtain) do not require tapers. Clinicians should discuss with patients undergoing tapering the increased risk for overdose on abrupt return to a previously prescribed higher dose. Primary care clinicians should collaborate with mental health providers and with other specialists as needed to optimize nonopioid pain management, as well as psychosocial support for anxiety related to the taper. If a patient exhibits signs of opioid use disorder, clinicians should offer or arrange for treatment of opioid use disorder and consider offering naloxone for overdose prevention. For pregnant women already receiving opioids, clinicians should access appropriate expertise if considering tapering opioids because of possible risk to the pregnant patient and to the fetus if the patient goes into withdrawal. If tests for prescribed opioids are repeatedly negative, confirming that the patient is not taking the prescribed opioid, clinicians can discontinue the prescription without a taper. Because of greater risks of benzodiazepine withdrawal relative to opioid withdrawal, and because tapering opioids can be associated with anxiety, when patients receiving both benzodiazepines and opioids require tapering to reduce risk for fatal respiratory depression, it might be safer and more practical to taper opioids first. Clinicians should taper benzodiazepines gradually if discontinued because abrupt withdrawal can be associated with rebound anxiety, hallucinations, seizures, delirium tremens, and, in rare cases, death. A commonly used tapering schedule that has been used safely and with moderate success is a reduction of the benzodiazepine dose by 25% every 1–2 weeks. If benzodiazepines prescribed for anxiety are tapered or discontinued, or if patients receiving opioids require treatment for anxiety, evidence-based psychotherapies (e.g., CBT) and/or specific anti-depressants or other nonbenzodiazepine medications approved for anxiety should be offered. Experts emphasized that clinicians should communicate with mental health professionals managing the patient to discuss the patient’s needs, prioritize patient goals, weigh risks of concurrent benzodiazepine and opioid exposure, and coordinate care. For patients with problematic opioid use that does not meet criteria for opioid use disorder, experts noted that clinicians can offer to taper and discontinue opioids. For patients who choose to but are unable to taper, clinicians may reassess for opioid use disorder and offer opioid agonist therapy if criteria are met. On June 8, 2018 it was my honor to present to the Kentucky Osteopathic Medical Association (KOMA) an update regarding requirements to prescribe controlled substances, particularly opioids, for chronic pain patients in Kentucky. It is nearly impossible to cover every important aspect of this subject in one hour, however I gave it an earnest effort. And as I promised the gracious KOMA attendees, what follows is the principal content of my presentation. To my osteopath colleagues, I thank you for all that you do, and I deeply appreciate the invitation to present at your annual meeting.